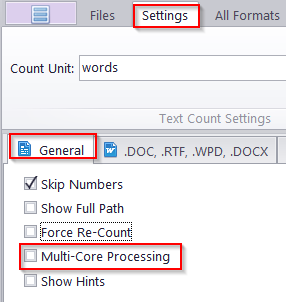 Please launch AnyCount in Admnistrator mode (right-click >> Properties >> compatibility >> enable "Run this program as administrator"), and disable "Multi-core processing" in "Settings > General". Then, please check your MS Office settings. Please start MS Word, open File - Options - General, scroll down to make sure "Open e-mail attachments and other uneditable items in reading view" is disabled. If the problem persists, please switch to the Trust Center section, click the "Trust Center Settings" button, choose "Protected view" and disable all checkboxes in this section.